Here at Android Police, we can't get enough good deals on apps. It's just in our DNA. And sometimes, our deal-seeking genetics tell us to do things we may have some reservations about. Like recommending free apps on the Amazon Appstore - which has its pros and cons. Today was one of the days where we couldn't help ourselves. Amazon currently has a promo going on called "Free App of the Day Greatest Hits," in which many of the most popular free apps of the day are on sale for the low, low price of - you guessed it - zilch. There's some great stuff, too - like Splashtop Remote Desktop, OfficeSuite Pro 6, TuneIn Radio Pro, and Radiant HD. Anyway, here's the link to the promo, which ends tonight (12/26) at midnight - it is, after all, the free app of the day promotion. Downloading some of these apps just for the heck of it and then removing them later is worth it, too - a fair number have a free $1 Amazon MP3 gift card included with "purchase." 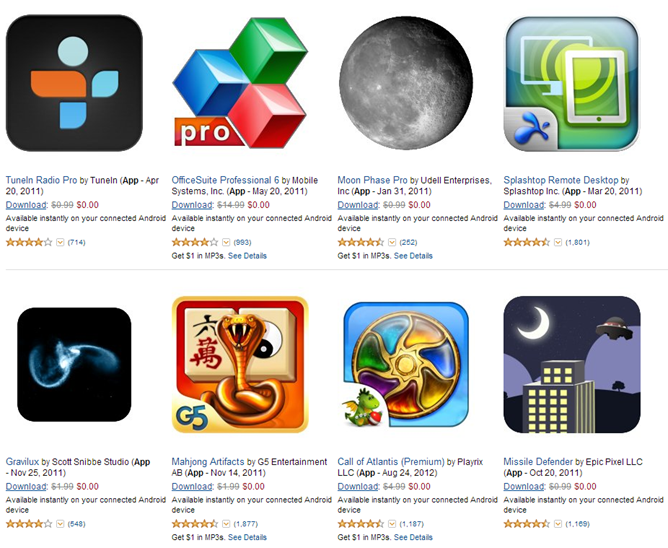 Amazon also has deals on a few other apps and games, which you're free to check out.